Somebody's been picking through their daddy's record collection, probably stealing it too. Germany's Snakebite has no pretensions. They rock like it's 1987. Call them a "throwback" band if you will, but these youngsters sound like they just played the stage at The Whiskey on the Sunset Strip. 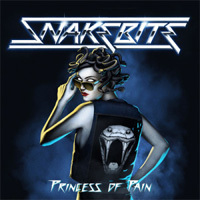 Snakebite delivers classic melodic hard rock with a metal edge. 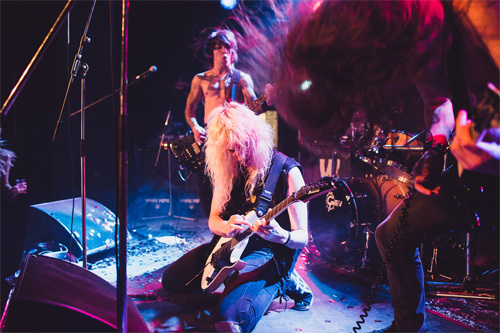 Following their Eighties predecessors, the band likely leans more to the leather and denim party metal than the make up and hair spray of sleaze glam metal. At the core of their sound and songs is melody, harmony, and groove. The first two come from the twin guitar harmony and vocal arrangements. As for the vocals, Dominik "Nikki" Wagner's delivery is straight forward, singing clean and melodic. However, not that he doesn't have some range, but his tone never seems to change either. He always sounds the same on every song. Is there some auto-tuning involved? I wonder. Also, typical of the genre, Snakebite uses lots of gang vocals in their arrangements. The groove comes from the simple fact that these are rock songs, with the rhythm section driving them along. Often times, you can really pick up the bass line, a good thing, as within Break The Spell, Cry For Rock, and Princess Of Pain. 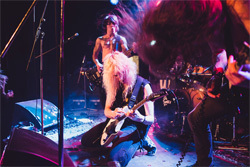 Also typical of the genre, Snakebite's guitarists delivers an abundance of sharp guitar solos. To mention a few other songs, Snakebite delivers a nice metal anthem with underdog motivational song We Rise. Also, there's After Dark, a quieter ballad number making good use of acoustic guitar before rising to stronger riffs and a nice solo. Alternatively, some songs seem to lag, not really pick up momentum and draw you in like All Or Nothing and Road To Nowhere. But I suspect they get much more energy when played live. Yeah. If the Snakebite boys were listening to their parents' Bon Jovi, Motley Crue, or Guns N Roses records, they were quick learners. They basically nail the genre, from start to finish. There's only one thing that bugged me about Princess Of Pain. There seemed to something to clean and rehearsed about the production. The band comes off as too precise, sounding nearly mechanical at times. It's just a feeling, nothing that should persuade you getting this album. (Just be thankful they didn't record it in Nashville.) Recommended. If the Snakebite boys were listening to their parents' Bon Jovi, Motley Crue, or Guns N Roses records, they were quick learners. They basically nail the classic hard rock and metal genre, from start to finish.